Do you want to treat wrinkles and signs of aging with acupuncture, but are afraid to be punctured by needles? Then try this Magic Eye Wand instead. 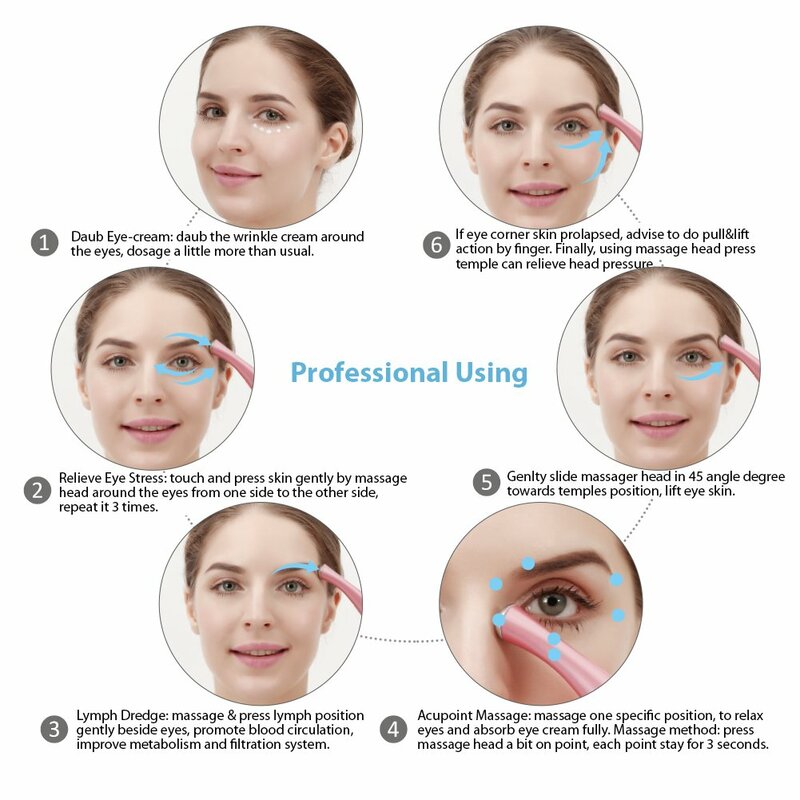 It uses ionic and vibration massaging, to efficiently tightens skin to remove wrinkles and black eyes. It’s a painless acupuncture stimulation that activates tissues, firms sagging and aging skin, promotes blood circulation, detoxes the meridians, and helps reduce muscle pain. 3. Gently massage skin around wrinkle part. Make sure you're firmly pressing the silver plate sensor against the skin. This instrument will work automatically once massage head and skin contact. Very interesting. My boyfriend is having a puffy eye so I let him use it. He liked it. The tip gets nice and warm after a couple minutes of use, and that’s good too. I like it so far .I put some eye cream on the brush, it helps me to absorb much better. But I prefer it can be rechargeable , not batteries. The BEST eye massager EVER！！！ I have now use it with the Estelle lauder night repair eye cream for almost 2 weeks. I can see obvious improvements under my eyes. It has smooth out some small wrinkles and bright my dark circles. The vibration is gentle and very comfortable. I enjoy the whole process. I also use it to massage my entire face with the La Mer face cream. I highly recommended this very affordable messaged as your daily route product. You really don’t need to spend hundreds of dollar for the high end one. This eye massager is really all you needed. It is very easy to use. Love the design of this product, easy to operate, easy to clean. Brought this for my dark circles, have been using it for a week, I feel like my eyes aren’t as dark as before, hope to see an obvious result as I continue to use it! I like it so far .I put some eye cream on the brush,it helps me to absorb much better. But I prefer it can be rechargeable , not batteries. I have been using this now for a couple of weeks and am seeing some difference. I do wish it was chargeable and not battery operated. If you are using it daily you basically have to change the battery once a week for it to run at full power. I love this eye massage machine, it helped to absorb eye cream as well, second day morning I still can feel my eye-bag moisture specially the temperature I love it, it's completely different compare with only use hand to put on the eye cream .Also it's very easy to use, warm temperature made my eyes very relax.It's very good staff. The BEST eye massager EVER！！！ I have now use it with the Estelle lauder night repair eye cream for almost 2 weeks. I can see obvious improvements under my eyes. It has smooth out some small wrinkles and bright my dark circles. The vibration is gentle and very comfortable. I enjoy the whole process. I also use it to massage my entire face with the La Mer face cream. I highly recommended this very affordable messaged as your daily route product. You really don’t need to spend hundreds of dollar for the high end one. This eye massager is really all you needed. It is very easy to use. You don’t need or push any button or charge it often. Just press on the areas where you wanna massage. It automaticly start the vibration. Easy to carry. You will love it!